The Request for Information and New Family Enrollment Forms are used by families the first time they enter their information into your CampSite database. Submitting either of these forms will establish a Parent Dashboard account. 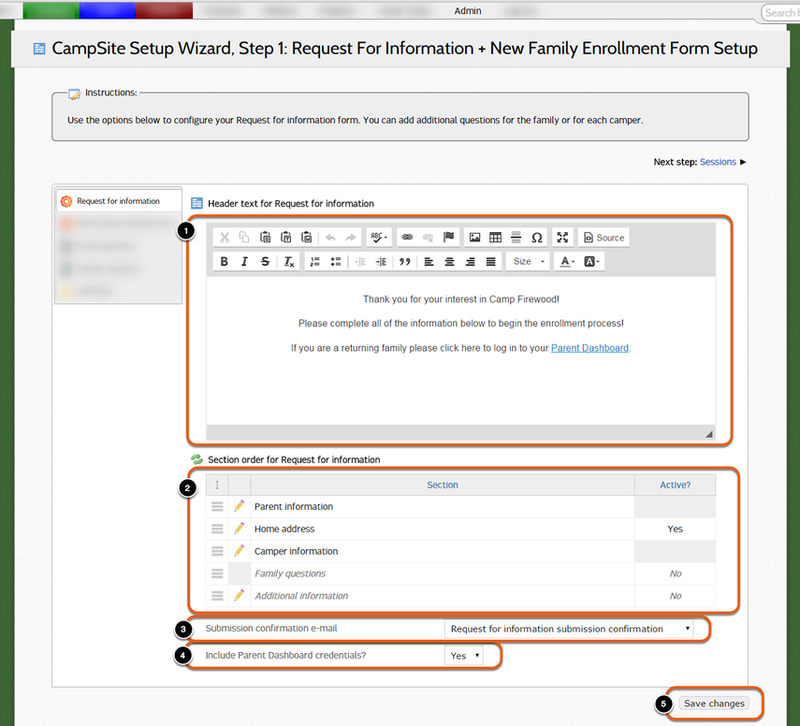 The Request for Information Form collects family and camper information and creates a Parent Dashboard account, but allows families to login later to select enrollment options for their campers. The New Family Enrollment Form collects family and camper information and immediately proceeds into the Parent Dashboard for parents to complete the enrollment process. The Request for Information and New Family Enrollment Forms will always require information at least one parent (Name and E-mail address) and the name of at least one camper. Additional information can be asked or required based on your camp's preference. Families will only need to complete one of these forms. Once their information is submitted, parents can login to the Parent Dashboard at any time to manage their information. 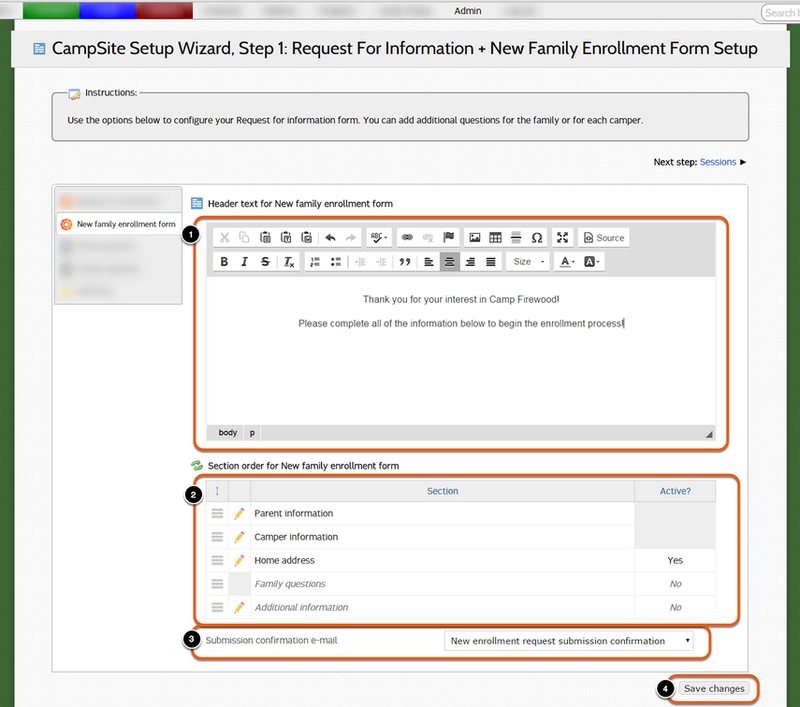 The Request for Information and New Family Enrollment Form Setup can be accessed through Admin > Camper > Setup wizard > Step 1: Request for information setup. The Request for Information is used by families who have never submitted their contact information to camp before, but are interested in learning a bit more about your programs before enrolling their camper. Submitting the Request for Information form will create a family and camper profile within CampSite, and a Parent Dashboard account will be established for when the family chooses to enroll. Sections can be toggled between Active and Invactive by double-clicking in the "Active?" column. The Parent and Camper Information sections to not have an Active setting, as they will always be displayed on the form. You may choose to include login credentials to the Parent Dashboard with the submission confirmation e-mail. If enabled, parents will receive a link to the Parent Dashboard with a temporary password. After making selections, be sure to click Save changes. The New Family Enrollment Form is used by families who have never submitted their contact information to camp before, but are ready to enroll! Submitting this form will move the family directly into their newly established Parent Dashboard account to complete the enrollment process. Submission confirmation e-mail (chosen from saved Family E-mails). This e-mail will automatically include Parent Dashboard credentials. Family questions can be created to collect additional information from your camp families the first time they enter their information. Please note that if you have not created any Family questions, the section will not appear on the Request for Information or New Family Enrollment Form, even if the section is set to Active for those forms. Click +Add family question... to add a new question. The new question has been added to the Family questions. Double-click to delete a question. Note: Questions cannot be deleted after they have been answered by a family. If this icon is grayed out, use the "Active?" setting to prevent additional families from answering the question. Click and drag to reorder questions. 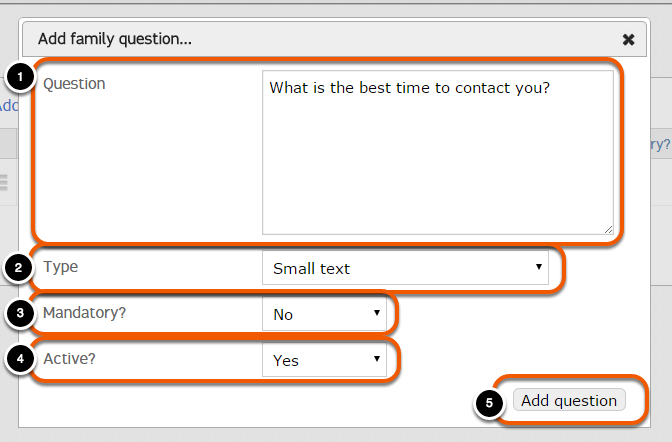 Camper questions allow you to collect additional information from new and prospective campers. The questions created in this section will only be asked the first time a camper’s information is entered into your database. There is a separate section later on Step 8 of the Setup Wizard where you can create questions that families need to respond to annually on their camper’s enrollment form. 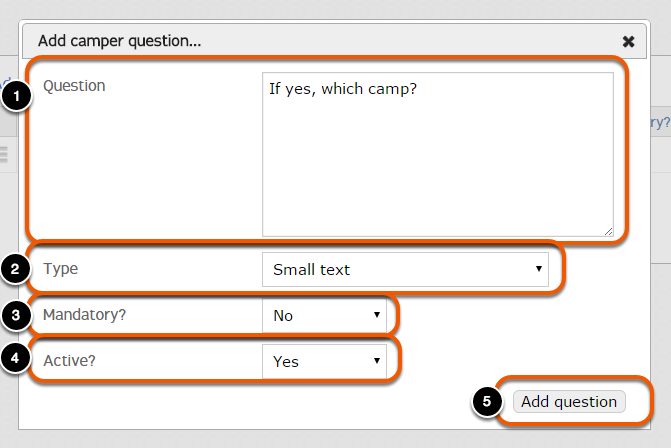 Click +Add camper question... to add a new question. The new question has been added to the Camper questions. The Request for Information and New Family Enrollment Forms may have the option for a CAPTCHA to be enabled for prevention of spam submissions. It is recommended that this is only enabled if necessary.